Park Entertainment have recently released more details on the progress of the upcoming K9 Series along with a new promotional poster. Although the poster shows very little that we didn’t already know,there appears to be a previously unseen “creature” in the background. 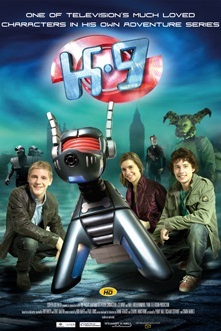 The long-awaited television series K9, featuring everyone’s favourite robot dog, is in post-production. Episodes are now being delivered and will be shown to TV buyers at MIPCOM in October. Originally created for the 1970s DOCTOR WHO series by Bob Baker and Dave Martin, K9 has long been an iconic television character. K9 is a children’s sci-fi/adventure series combining comedy, action and suspense – “X Files” meets “Men in Black” with a zany dash of “Ghostbusters”. K9 mixes live action characters with stunning visual-effects. K9 and his three teenage companions become the earth’s front line defence against dangers threatening from anywhere and anytime in the galaxy. They will have a lot of fun, action, adventure, and some scares along the way, saving the earth from alien creatures, monsters and more than a few human threats.